This article represents a personal analysis based on public information from the LeaderBoard. These interpretations have a personal and does not represent the official position of ImagineCup. In this top are missing this year, countries with tradition in IT Challenge such as Brazil and Egypt. We hope in a spectacular comeback for the last test. New countries in the Top are Ukraine, Estonia and Turkey. A big welcome and congratulations for organizers and ADE. The decrease in the number of participants is firstly due to shrinkage of the number of participants from India, from 428 in Quiz 1 down to 192 in Quiz 2 and then down to 83 in Quiz 3. The great number of participants, from India, in the Quiz 1 reflected the process of selection for the MSP. This technique can be used in the processes of selection of the MSP and in other countries because IT Challenge covers a wide range of technical products from Microsoft: the servers, clients area and area of cloud-computing. Q. Why is based on the sum of the top scores? A. 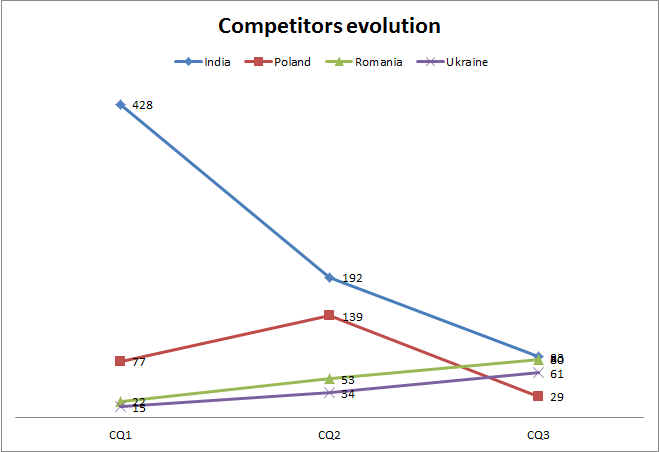 Because it is a criterion measure of competitiveness. The more you are involved in competition and better prepared you can get a bigger score and a better position in the rankings. eljiudia (Romania) has obtained the highest score of the current edition, but ESI60596 (France) has the best average of scores. Last year the highest score was 28. We expect to see an improvement of the results in the following quizzes. Why to participate in IT Challenge? For more details about how to participate in IT Challenge please visit our official web page. Also we are appreciate your "Like" on our Facebook page. Imagine Cup is the world’s premier student technology competition. Already more than 300,000 students from more than 142 countries have competed. Join Today!! Share the article with other Indian students with our congrats. Congrats also for France, Ukraine, Poland and Romanian students. France the best avg score. Valy what about womans in IT Challenge? Harjyot: On next monday because I’m in travel right now.